The altar was placed directly in line with the middle of the entrance of the tabernacle, and further inside than the Table of Showbread and Golden Lampstand, where it sat in front of the Veil. It stood about three and a half feet tall and 21 inches square. Even though the smallest of the tabernacle's furniture, the Golden Altar of Incense was important, just as all the others were, each with its own use and purpose. The Altar was made from shittim (Acacia) wood overlaid with gold…representing a connection between earth and heaven. The wood, as can be recalled from other descriptions in this series, had to be worked from its gnarled and twisted form into something smooth and straight, then covered by gold. That is the work of God; taking us from our natural, carnal, decaying state, and transforming us into something of everlasting value and duration. The altar was square, representing the four corners of the earth to which the gospel must reach and from which the prayers of all of God's creations can be heard. On each corner of the Altar was a horn, representing strength. Beyond the veil was the Ark of the Covenant, representing the throne of God. A molding or crown sat atop the Golden Altar of Incense to keep the fire from spilling off the sides. This can represent the glorious Christ, crowned with victory in fulfilling His mortal mission. The Bronze Altar of Sacrifice found outside the tabernacle had no crown, representing Christ in this world, one of pain and humiliation. The bronze altar represents suffering and death, typifying our Christ as Savior and sacrifice. The golden altar within the tabernacle represents triumph over death, mediation or intercession between God and man through Christ. Both altars were square, representing Christ's sacrifice (bronze altar) and atonement or intercession (golden altar) are available for the entire earth. 1 In the year that king Uzziah died I saw also the Lord sitting upon a throne [Ark of Covenant], high and lifted up, and his train filled the temple. 2 Above it stood the seraphims [these were embroidered on the Veil]: each one had six wings; with twain he covered his face, and with twain he covered his feet, and with twain he did fly. 3 And one cried unto another, and said, Holy, holy, holy, is the Lord of hosts: the whole earth [4 corners of Altar of Incense] is full of his glory. 4 And the posts of the door moved at the voice of him that cried, and the house was filled with smoke [from the Altar of Incense]. 5 Then said I, Woe is me! for I am undone; because I am a man of unclean lips, and I dwell in the midst of a people of unclean lips: for mine eyes have seen the King, the Lord of hosts [Veil of unbelief has been parted]. 7 And he laid it upon my mouth, and said, Lo, this hath touched thy lips; and thine iniquity is taken away, and thy sin purged [sanctified]. 8 Also I heard the voice of the Lord, saying, Whom shall I send, and who will go for us? Then said I, Here am I; send me [spread light of gospel - the Golden Lampstand]. The Golden Lampstand and the Altar of Incense were linked together through the service required by the priests. 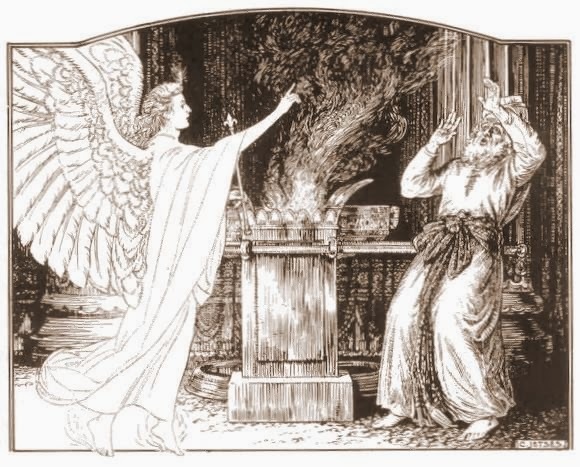 Every morning and night incense was placed upon the altar at the time the lamp was trimmed: Prayer (altar) and resulting Light and Truth (lampstand) can and should go hand in hand…sacrifice and knowledge. Equal parts of various substances finely ground were mixed to create the incense. It is uncertain exactly what some of the ingredients were made or came from. Stacte is hypothesized to be myrrh or some other sap. Onycha comes from the Hebrew word shecheleth, which means "to roar; as a lion" or “peeling off by concussion of sound." When the Torah was translated into Greek (the Septuagint version) the Greek word “onycha” ονυξ, which means "fingernail" or "claw," was substituted for shecheleth. Possibilities include tree resins, gums, or shells. Galbanum is an aromatic gum-resin with a bitter-sweet odor and bitter taste. These were blended with frankincense to make the incense. The incense was then burned on the altar, which is described above as the "testimony in the tabernacle of the congregation", a place where the Lord will come to "meet with thee". Note also how these substances are symbolic of various aspects of Christ's life (gifts from the wise men, experiences in His life and death/crucifixion/burial). 5 There was in the days of Herod, the king of Judæa, a certain priest named Zacharias, of the course of Abia: and his wife was of the daughters of Aaron, and her name was Elisabeth. Angels execute the will of the Father, intervening before the veil of the temple, which separates man from the throne of the Father. What miraculous connections enduring thousands of years.